I am in the Tampa Bay area for the World Series. I am neither a fan of the Phillies nor the Rays. I am here for work. I got a cool job. 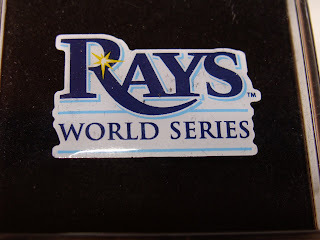 Anyway, walking around Tampa, Clearwater and St. Pete, you can't help but notice the sudden pride for the Rays. This was a team that finished 26th out of 30 teams in attendance and, suddenly -SUDDENLY- everyone is a fan. Well, not so much in the Clearwater area where the Phillies have had their spring training facility for 47 yearfs. Just wanted to show everyone the media pin I got from the MLB today when I picked up my credential. (I'll post the pic when camera battery is charged). Set Builder? Player Collector? Come on down!